Canada’s nursing sisters were required to perform their duties in unpleasant and hazardous surroundings. Approximately 40 nurses who were members of the Canadian Expeditionary Force (CEF) died during the First World War as a result of illnesses acquired in active service. Others died after the Armistice from conditions attributable to this service. However, what was more shocking to Canadians were the 21 deaths of nurses from direct enemy action. 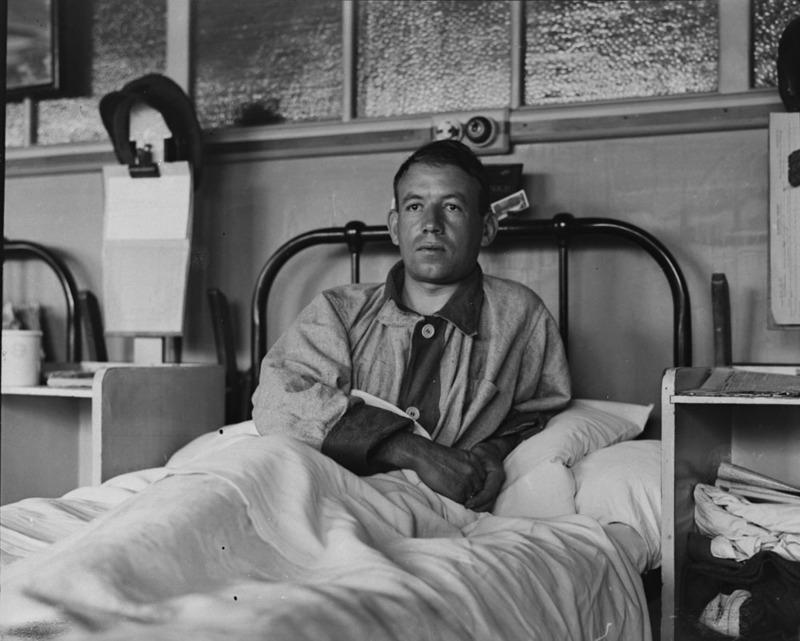 This post briefly describes these events, and helps readers explore selected documents about military nurses. Nursing sisters served in Canadian Army Medical Corps (CAMC) hospitals, Casualty Clearing Stations, and other facilities that were supposed to be out of the range of enemy artillery. However, accurate long-range artillery and new technologies, such as aerial and submarine warfare, brought these women into direct contact with the enemy. 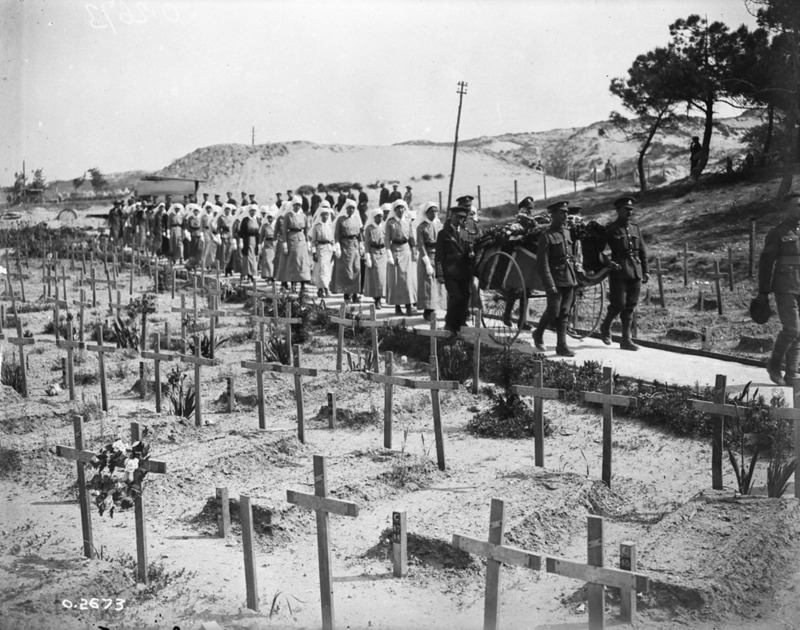 In several events starting in May 1918, nurses were killed in the line of duty because of enemy attacks. In Canada, press reports seized on the propaganda potential of these terrible events, to help bolster support for the war effort and promote new recruitment campaigns. 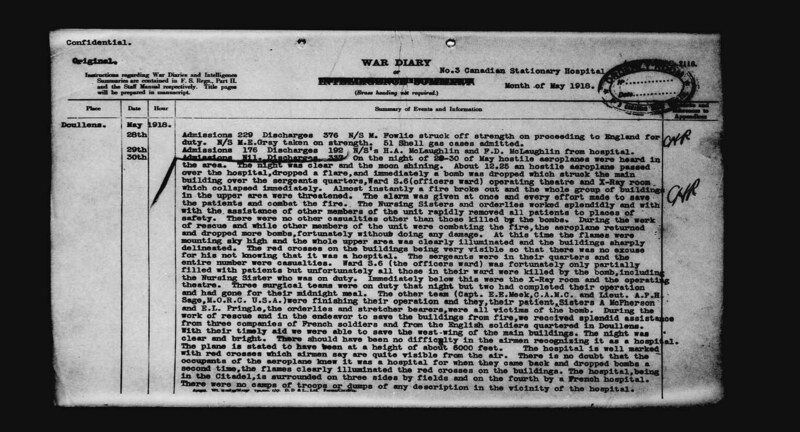 During May 1918, two Canadian hospitals were bombed by German aircraft. Katherine Macdonald, from Brantford, Ontario, became the first Canadian nursing sister killed by enemy action in the Great War, when No. 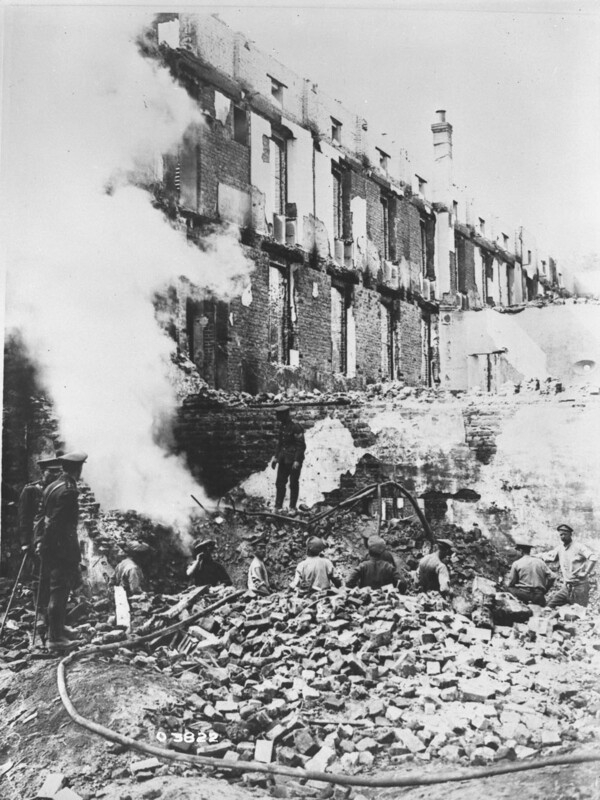 1 Canadian General Hospital, located at Étaples, France, was bombed by German aircraft on May 19, 1918. Two of her wounded colleagues died soon afterwards. Official photographers captured scenes of the devastation and somber funeral processions for the nurses and the other medical staff and patients killed in the raids. At the end of the month, No. 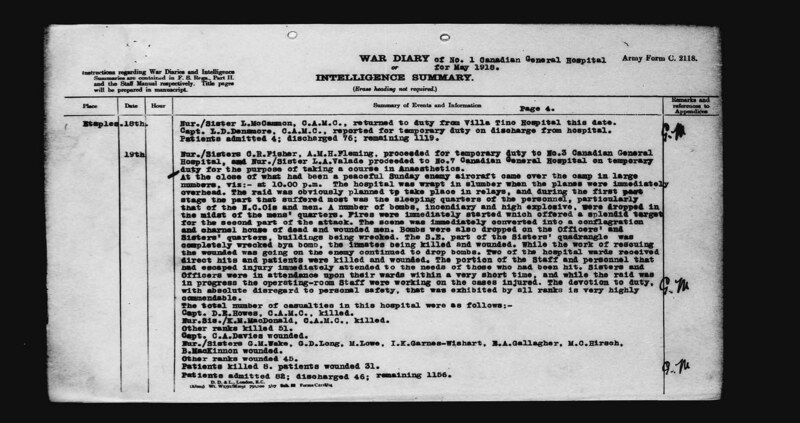 3 Canadian Stationary Hospital at Doullens, France, was also bombed. Three more nursing sisters died. Two of them, Nurses Agnes MacPherson and Eden Pringle were killed, along with doctors, medical orderlies and a patient during surgery. 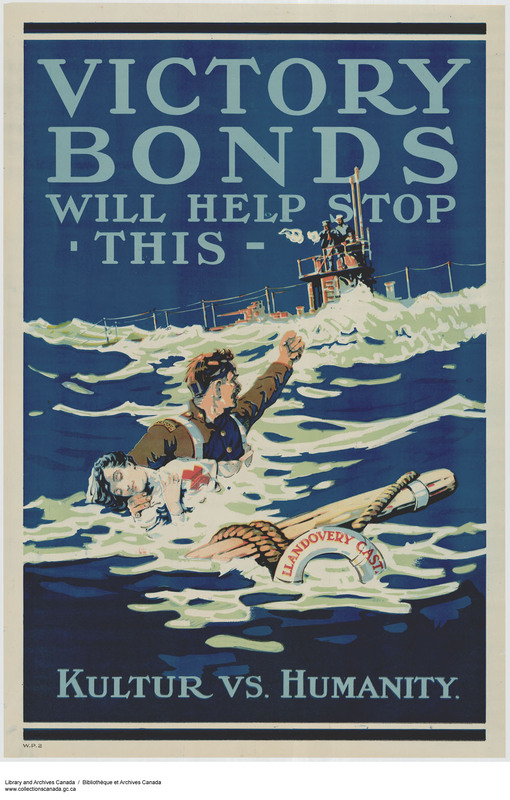 Less than a month later, on June 27, off the southern coast of Ireland, the German submarine U-86 torpedoed the Canadian hospital ship Llandovery Castle on its return to England with only medical personnel aboard. The former passenger liner was steaming along at night, with special lighting illuminating its distinctive white hull and large red crosses. This clearly identified it as a hospital ship and a forbidden target for any belligerent. Once hit, the ship listed severely, hampering efforts to launch lifeboats. Many of the nurses had been asleep, and now struggled to evacuate the sinking ship. 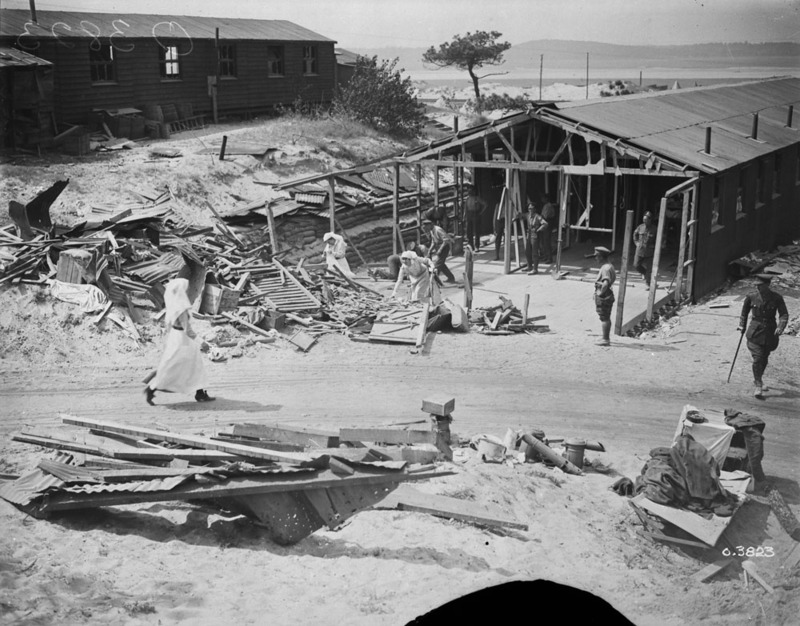 The entire group of nursing sisters boarded a lifeboat, with Sergeant Arthur Knight, CAMC. Tragically, the boat was swamped by suction caused by the violence of the ship’s sinking. Only Knight survived to struggle into another boat. These terrible events were compounded by the actions of the submarine’s crew. Survivors testified that the submarine ran down and fired on lifeboats, killing more crew and medical staff. Only one boat escaped the night’s events. The bodies of the 14 nursing sisters were not recovered, and today these brave women are commemorated on the Halifax Memorial. Documents in their service files reveal that nurses like Christina Campbell, from Victoria, British Columbia, were experienced nurses who had also been treated for conditions such as neurasthenia (“Shell Shock”), nervous debility, insomnia, and general exhaustion from service near the Front. Today, cemeteries and monuments overseas, memorials across Canada, and entries in the Books of Remembrance in the Peace Tower in Ottawa pay tribute to First World War nurses who died in the service of Canada, tending to the wounded. 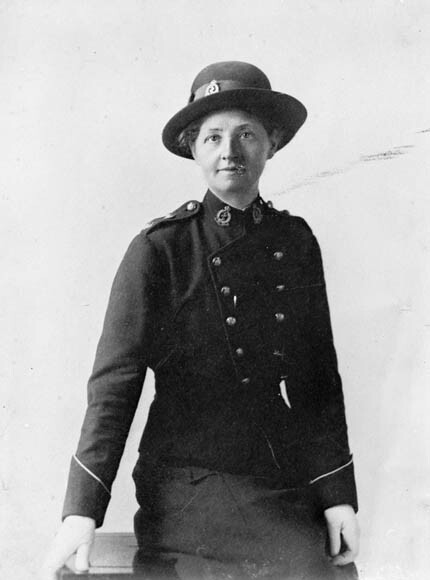 With the digitization of the CEF service files, visitors to the Library and Archives Canada (LAC) website can quickly and easily gain access to a wealth of genealogical and historical information, and form their own impressions of the First World War service of these women, and all members of the CEF. Please explore the links below for service files recently made accessible online. When they exist, the digitized Circumstances of Death registers have been linked. NS Katherine M. Macdonald (Brantford, ON): Killed in Action, May 19, 1918. NS Henrietta Mellett from London, Ontario, died at sea during the sinking of RMS Leinster, on October 10, 1918, when she was returning from leave to service with 15th Canadian General Hospital. An experienced military nurse, she had already served with the Red Cross in France, Egypt and England. She perished with more than 500 other passengers, when the Leinster was torpedoed by the German submarine UB-123 in the Irish Sea. Examples of sources about nursing sisters that are in LAC’s collection and in other institutions can be found at 100 Stories: Lives of the First World War, LAC’s Nursing Sisters blog post (published July 23, 2015) and the web page, The Call to Duty: Canada’s Nursing Sisters. Alex Comber is a Military Archivist in the Government Archives Division. This entry was posted in Military Heritage, Our Collection and Facilities by Library and Archives Canada Blog. Bookmark the permalink. You’re missing the names of the 18 Canadian nursing sisters who died in France and England. They died of illness.